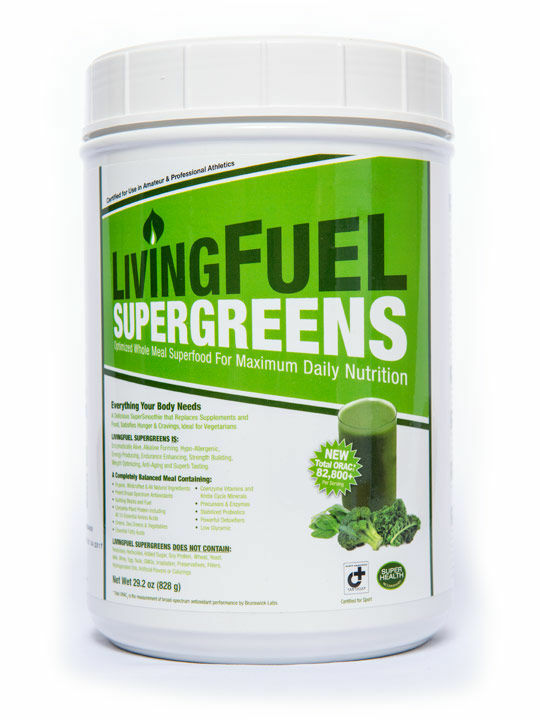 Living Fuel SuperGreens is an all-natural meal replacement that provides the nutrients you need without unnecessary calories. SuperGreens is a whole, raw, complete, foundational superfood - a blend of organic, wild crafted and all natural foods that have been optimized with the most bio-available and usable nutrients in existence. SuperGreens is much more than your typical Greens drink. SuperGreens has a nearly 2:1 protein-to-carbohydrate ratio and a 2:1 carbohydrate-to-fiber ratio. Plus it has numerous nutrients that support the stabilization of blood sugar levels. Therefore, you can mix in small amounts of any kind of juice or fruit and still not raise blood sugar levels significantly. 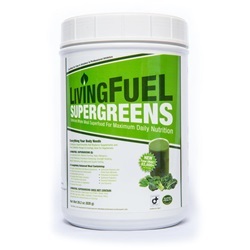 Living Fuel SuperGreens are a unique formulation of organic vegetables and grasses, carefully selected to ensure a broad therapeutic potency. Barley is a great source of Vitamin A. Broccoli contains anti-cancer phytochemicals. Spinach is an excellent source of Vitamin C, A, and K. Kale contains beneficial carotenoids such as lutein and zeaxanthin, which are related to eye health. Carrots have beta carotene, a powerful antioxidant. And spirulina has the highest concentration of beta carotene, Vitamin B-12, and the rare essential fatty acid, GLA. All of these vegetables are an excellent source of fiber (see Super Berry®) and contain chlorophyll (the pigment that gives plants their green color), which is very cleansing and works to rid the system of heavy metals and other toxins that can damage our health. Each container of SuperGreens contains 12 servings or 12 complete meals. For those who use SuperGreens as a supplement, there can be up to 48 servings per container. Living Fuel, Super Berry®, CocoChia® and Super SeaGreens® are trademarks of Living Fuel, Inc., and are used with permission. Optional: Mix one scoop of LF Rx Super Berry with one scoop of LF Rx Super Greens. Replace 1-2 oz of water with your favorite fruit or vegetable juice. Add frozen berries or other low glycemic fruit and your favorite Omega 3 oil, coconut oil or finely desiccated coconut.